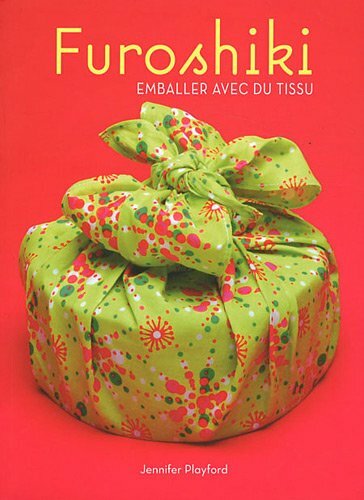 This is an easy book on basic techniques for furoshiki. It starts with a brief history of furoshiki, meanings of traditional motifs,tips on fabric choice, and basic techniques for knots. It then presents 12 basic techniques for wrapping different shaped objects, and 8 more creative projects (with ideas for reciclying old shirts for example). (on english edition there seems to be more projects). Most of the techniques presented are the basic ones you can find on internet, but I find it useful to have them always on hand, with photos of variants, the finished wrap, etc. The instructions are drawn, they are pretty clear but for some of the projects there are a few drawings that doesn't show the exact proportions of the fabric. so for example you are supposed to make handles from the free corners of the furoshiki, the drawing show you a lot of extra fabric that in the real world and with a real square you don't have.. and it can makes you doubt you are doing thing right. But it's just limited to a few drawing, overall I found them clear to follow. I noticed that too. But this is probably due to using bigger furoshiki than I have.